As concerns about the economy deepened in 2007 and expanded throughout 2008, not all media outlets paid equal attention to the crisis. Generally speaking, daily newspapers—which, in many cases, have sizeable business staffs regularly covering the subject—have been in the forefront of economic coverage. Even on just their front pages, newspapers have covered the story more than other media. From January 2007 through June 2008, more than 6% of the newshole studied in newspapers has focused on the economy. The second-highest level of overall economic coverage came from the evening news programs on ABC, CBS, and NBC, the shows fronted by Charles Gibson, Katie Couric and Brian Williams. Those three programs devoted just under 6% of their airtime to the economy. (In the second quarter of 2008, coverage of the economy on the nightly newscasts, at 12%, actually edged past newspapers, at 11%.) Traditional news radio—the hourly five-minute headline newscasts and NPR’s Morning Edition—was right behind, also almost at 6%. In other words, one thing clearly revealed by this report is that coverage of the economy was more extensive in the so-called “old media” platforms, the traditional legacy media of newspapers, broadcast television news and radio news. 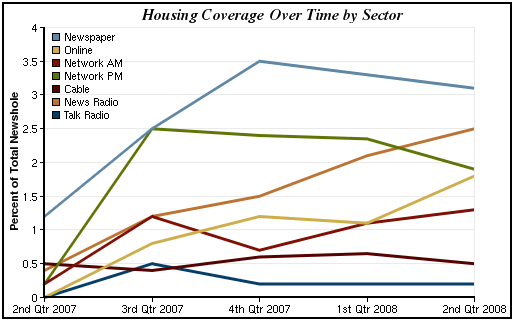 Conversely, some of the lowest levels of coverage were in the newer media platforms, such as talk radio and cable news. These are segments of the news universe that tend to rely more strongly on opinion and debate. Since January 2007, only 2% of the airtime studied on cable news was devoted to the economy, sixteen times less than the time cable devoted to the presidential election. That number is strikingly similar to how much time was spent on the subject on talk radio, by hosts such as Rush Limbaugh on the right or Ed Schultz on the left (1.9%). In another media platform, online news, attention to the economic crisis increased significantly over time. But overall, the news websites were in the middle of the pack when it came to covering the economy (4% of newshole studied), behind the traditional media sectors, but substantially ahead of cable and talk radio. These findings, about the tendency of traditional media to cover this complex story more than some newer media, have implications for the future if current trends continue. The media that have covered the economy more extensively are the ones at the moment are most in decline either in audience or in their revenue base. 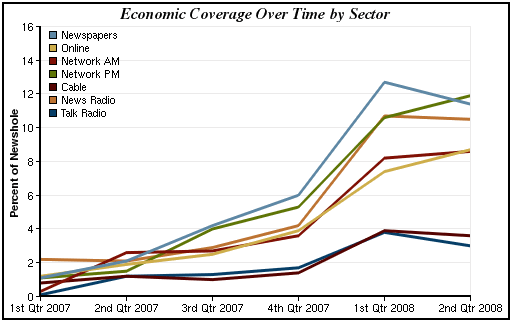 Even as the trend lines in overall economic coverage look largely in sync, a closer examination of the data indicates that coverage of some crucial elements of the overarching economic story varied substantially by media sector. Some storylines get more coverage in one medium, while others seem more suited to other platforms. When it comes to economic news at least, in other words, the medium to some extent is the message. Gas prices, in contrast, seem to be a story made for network TV, with television-friendly visuals illustrating the impact on consumers. Although the level of coverage of energy costs was fairly uniform among media sectors through 2007 and the early part of 2008, that changed when the story caught fire in the second quarter of this year. In that period, gas prices filled nearly 7% of the newshole on network evening news, nearly double the percentage of the front-page newshole in print and more than triple the percentage of coverage in the cable airtime studied. 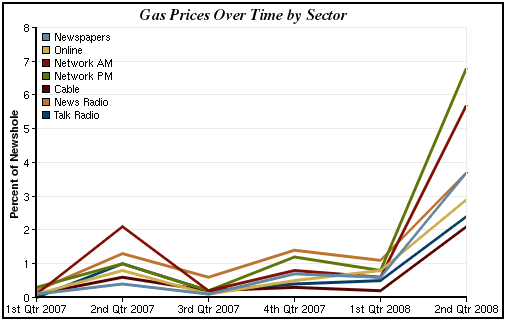 Rising gas prices also became a very big story on the network morning news shows in the second quarter of 2008, where the subject accounted for almost 6% of the airtime studied. Although it was a small component of overall economic coverage, there was also a marked difference in how some media sectors covered news about unemployment and jobs. Most notably, online news has consistently paid the most attention to that issue. That trend became even more pronounced in 2008, and particularly in the second quarter, when the news websites devoted at least twice as coverage to the unemployment situation than any other sector. In short, what one knows about the economy, or even what one might think is the biggest economic issue, depends heavily on where one gets the news. The breakdown of economic coverage by media sector, when matched with public attitudes about the economy, may also suggest something about the storytelling power of television. The subject that was covered most extensively on broadcast news, and the one that has seen a huge spike in network coverage in the second quarter of 2008, seemed to have the largest impact on the public psyche. That can be seen in the recent Pew Research Center for the People & Press survey in which the percentage of Americans who say that rising energy prices are the most important economic problem facing the country jumped from 11% in February 2008 to 38% in July. As the public has focused more on energy prices as an economic culprit, concerns about other elements of the fiscal crisis have diminished. The People-Press survey revealed, for example, that between February and July of this year, the percentage of Americans who consider jobs and unemployment and housing to be the leading economic ills has fallen. That may reflect both the visceral impact of rising gas prices on the daily lives of millions of citizens as well as the psychological potency of messages hammered home on television.